This decadent and rich chicken will knock your taste buds silly! You’re mixing the deep flavors from chicken thighs, with carrots, tomatoes and wine sauce. It’s fabulous with rice, pasta and potatoes - so serve it with whatever your heart desires. Enjoy! Place the chicken thighs into the base of the slow cooker. Dice the onion into large chunks. Peel and slice the carrots into 1/4-inch circles. Place the onion and carrot pieces around the chicken. In a mixing bowl, whisk together the white wine, chicken stock, tomato paste, minced garlic and Italian seasoning. Pour over the chicken and veggies. 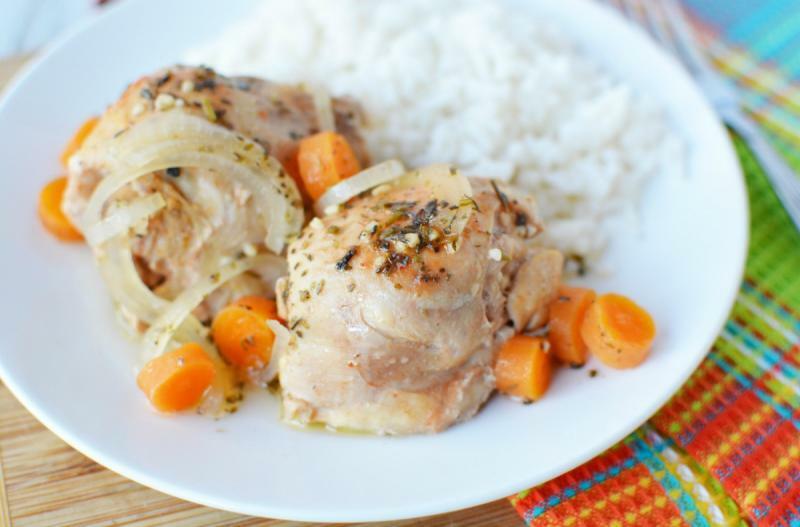 Serve Slow Cooker Chicken Osso Bucco with rice and veggies. Dice 2 onions into large chunks. Peel and slice 4 whole carrots into 1/4-inch circles. In a mixing bowl, whisk together 2 cups white wine, 2 cups chicken stock, 2 Tbsp tomato paste, 4 tsp minced garlic and 2 Tbsp Italian seasoning.